As you pass through the Dolomites, you'll notice many of the road signs are in two, or even three languages. The third (or first, depending on your viewpoint) is Ladin. Ladin is a close cousin of Furlan (Friulan) and Romansh which are widely spoken in Friuli, and in the Graubunden in south-east Switzerland respect­ively. The Ladin valleys have their own distinctive culture, and tradi­tions. There are an estimated 35,000 Ladin speakers in the five valleys in the core of the Dolomites: the Badia, Gherdëina (Val Gardena), the Val de Fascia (Val di Fassa), Fodom (Livinallongo) and Anpezo (Ampezzo). The Ladin valleys are one of a number of linguistic islands that you'll find across northern Italy — for example, not far off the route, near the Sella di Ciampigotto in Friuli Venezia, is the german-speaking village of Sauris (Zahre) where the language preserves archaic features of Tyrolean Bavarian. 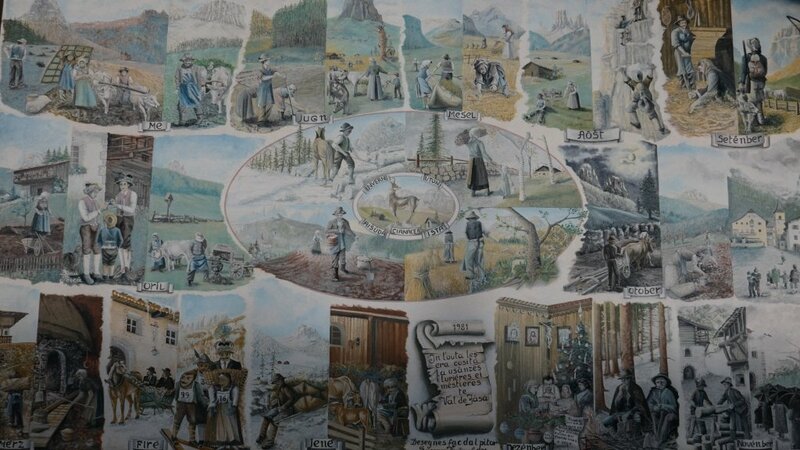 The Ladin valleys have a partic­u­larly rich tradition of story-telling. Here are very, very, brief summaries of some of the main myths and legends. Sorapiss is the mountain that you can see as you look south over the Lago di Misurina. According to the legend, Sorapiss was the king who ruled the area. An elderly widower, Misurina, was his adored, and very spoilt and capri­cious, young daughter. Misurina heard that a sorceress on the Monte Cristallo had a magic mirror that told the thoughts of whoever looked into it. Misurina begged her father to acquire the mirror at any cost, and eventually, Sorapiss gave in. The sorceress held out for a long time against their entreaties, but finally, in an effort to get them to give up, she said that they could have the mirror if, in return, Sorapiss agreed to be turned into a mountain. The child was delighted with the mirror and delighted that her father would be prepared to be turned into a mountain to make her happy. As she looked into the mirror, her father started to change. Suddenly realising that she was now high up on a mountainside, Misurina was overtaken by vertigo and fell into the abyss. The Misurina lake was formed by Sorapiss; tears at the fate of his beloved daughter. The magic mirror fell into the lake and shattered into fragments — the reflec­tions you can see on the surface of the lake are reflec­tions from the magic mirror. The legend of the Rosengarten (Rose Garden) group is a story of unrequited love. The Re Laurino was the king of the dwarves who had a beautiful rose garden around his castle. Laurino lost his kingdom, the woman he loved, and the woman who loved him, in a war with Theodoric, the king of the Goths. After years as a prisoner, he returned home. Overcome by grief on discov­ering that all his people were gone, he cast a magic spell to turn the rose garden to stone and make it invisible by day and by night. But he forgot to mention sunset in his spell and so, from that day on, the rose garden becomes visible for a few minutes as the sun comes down, and the rocks glow in the rays of the setting sun. The Lago di Carezza (Karersee) is known in Ladin as the Lec de Ergobando (or "arcoboàn") —the Rainbow Lake. According to the legend, seeking to win the love of a nymph who lived in the lake, a wizard created a stupendous rainbow stretch between the Latemar and Catinaccio mountain groups on either side of the lake. He was so captivated by the beauty of the rainbow, that he forgot to put on his disguise. As soon as she set eyes on the wizard, the nymph realised the trick and dived back into the lake, never to emerge again. Grief-stricken, the wizard smashed the rainbow to pieces, and threw the pieces into the lake. The story of the Kingdom of Fanes is a long and complex saga, but the very brief outline is that the queen marries a foreign king, who becomes king of the Fanes. However, the king betrays his new kingdom. He is turned to stone on the mountain above the Passo Falzarego — the name of the pass comes from the Ladin for 'false king'. Defeated in battle, the survivors of the Kingdom of Fanes are said to have taken refuge in the subter­ranean kingdom of the marmots. According to the legend, the door to the kingdom is at the bottom of the Pragser Wildsee (Lago di Braies).